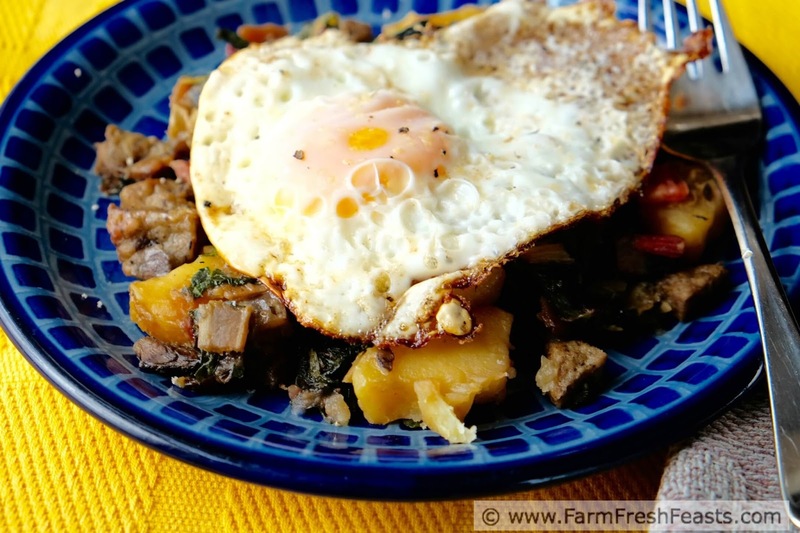 A skillet supper of Swiss chard, potatoes, mushrooms and sausage served with an egg on top. "There should be a Sausage Monday"
I fixed this on a Monday night, after getting the idea from a similar 'throw in whatever's handy' supper the week before that turned out surprisingly good. 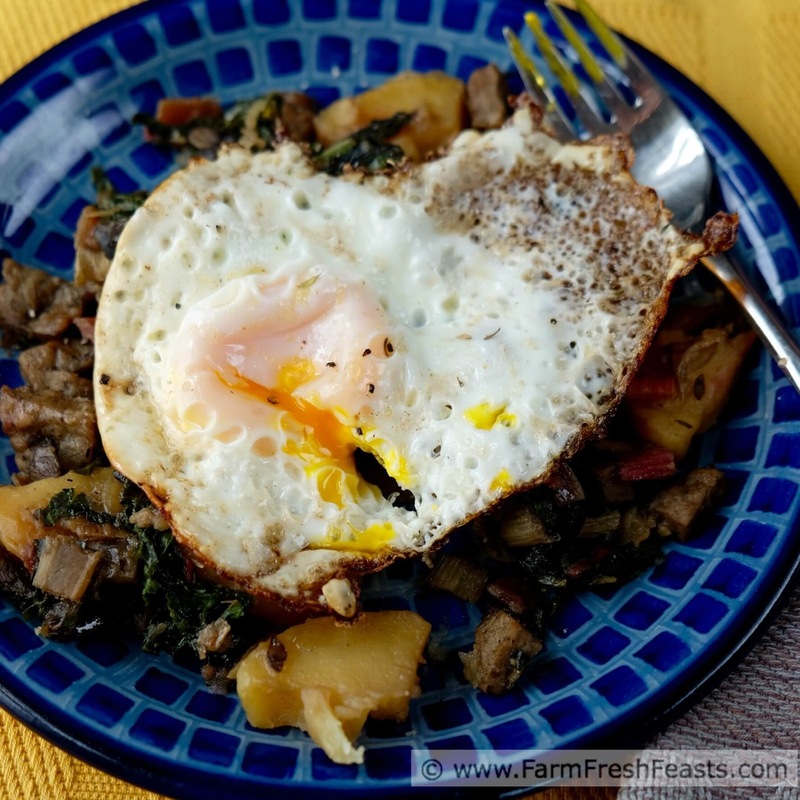 I was going to leave out the sausage and serve the hash with an egg on top. My spouse came in and asked what was for dinner. After I shared my vision he commented "that would be good with sausage". I replied "I was going for a Meatless Monday meal". He said, "there should be a Sausage Monday". So, sausage it is. Feel free to adapt to your Sausage or Meatless Monday needs by doubling the mushrooms in place of the sausage. For other recipes using Swiss chard, please see my Swiss Chard Recipes Collection. For other recipes using potatoes since I have 25 pounds of them from the Community Supported Agriculture (CSA) farm share, please see my Potato Recipes Collection. Same thing for the Mushroom Recipes Collection (not 25 pounds, just check it out), all part of the Visual Recipe Index by Ingredient--a resource for folks like me eating from the farm share. 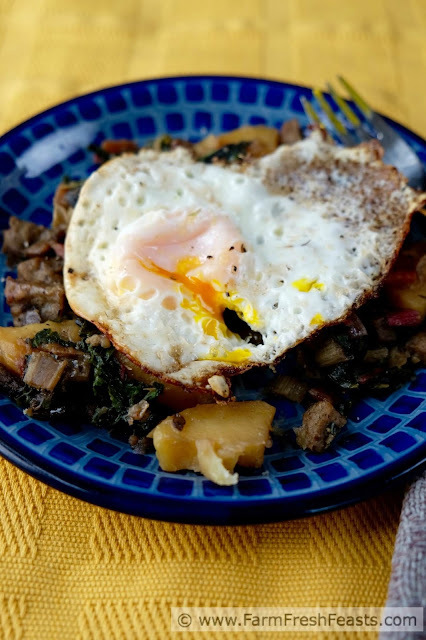 I'm also contributing to The Spiced Life's Mushroom Mangia board on Pinterest, have a Potatoes board on Pinterest, and interesting chard recipes that catch my eye live on my Greens board on Pinterest. Want to know How to Use This Blog? Click here. Preheat oil in a large [I use my 12 inch cast iron which is heavy as sin but works great] skillet over medium heat, and make sure you've got a cover that fits as you'll need it later. Add chard stems and onions, stir to coat with fat, and sauté for 5 to 8 minutes until they start to soften. Add Worcestershire sauce, sausage, potato and mushrooms to the skillet and stir to combine. Cook another 3-5 minutes until the mushrooms have given up their juice and the sausage is no longer pink. 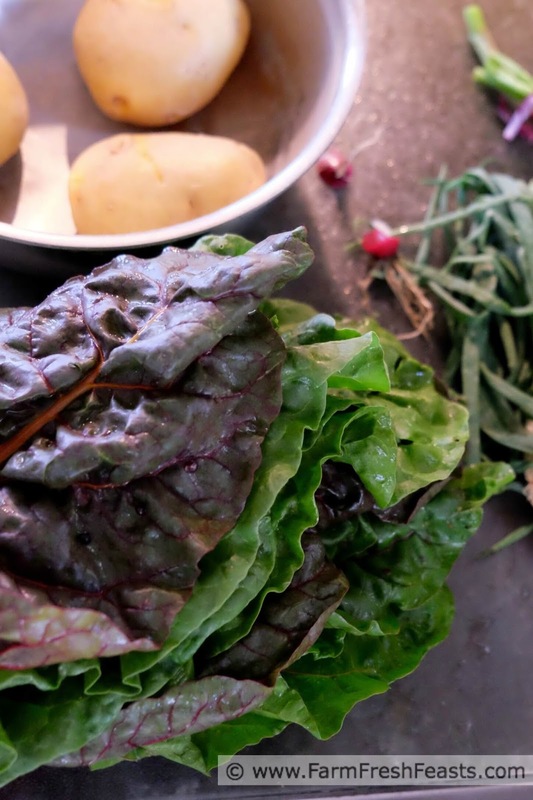 Place a handful of chard leaves in the skillet, cover the skillet, and leave it for 3 minutes. Stir the now-wilted leaves down into the skillet and repeat with the remainder of chard leaves until all the chard is wilted and stirred into the mixture. Taste and see if you need more salt and/or pepper. In a separate skillet fry eggs and serve over top. I'm a fan of anything that has hash in the title, and I do mean the legal kind. Probably because it usually involves some sort of potatoes and you know how I feel about those bad boys. I thought I was nuts to get 25 pounds of potatoes at one time from the farm share, but it's worked out swimmingly well. I love the addition of swiss chard in here. Gives it some nice color and flavor! I'm trying to stuff this chard anywhere I think I can get away with it.